Bidooh — From mobile to billboard in just 60 seconds! Want to advertise your product? Want to let people know about an event? Bidooh is a new digital billboard advertising company that allows you to do all the above in about 60 seconds flat! Create your advert, choose the location where you want it to display, decide how long you want to display your advert and then hit the publish button! Advertisers or anyone who has a product they want seen on the streets. Smaller advertisers or even individuals are on the same level playing field as the big advertisers. BIDOOH IS AVAILABLE TO EVERYONE! You don’t need to hire a top designer or have a large advertising budget. 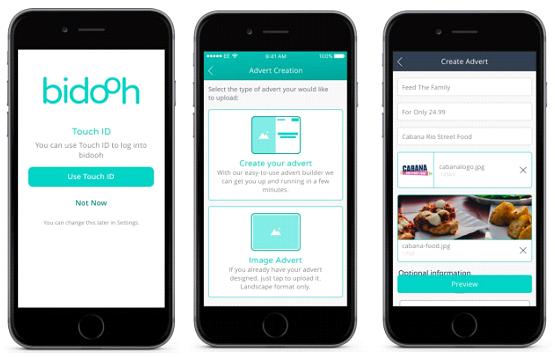 Bidooh’s online platform or their soon to be released app streamline the whole process from creation through to the advert going live. 3. Decide on your budget and when and how long you wish your advert to be displayed. Currently Bidooh charges a minimum of 1p (1.4 cents) for a 10 second advert slot. DOES THAT SOUND INSANELY CHEAP? Publish your advert with a click. A member of the Bidooh team checks and approves your advert at which point your advert goes live. NOW THAT’S SIMPLE! Present day digital billboard advertising is slow and cumbersome. Customers still need to phone or email the advertising companies and slow response times mean that customers may wait days or weeks to get their adverts published. The prohibitive costs this slow moving process entails means that very small advertisers are often priced out of this particular market. Bidooh wanted the ordering of advertising space on digital billboards to be as simple as ordering an Uber and they wanted any business to be able to buy billboard advertising space in real-time. Doing away with the need for any middle-men makes Bidooh lightning fast in comparison with present day advertising companies as well as hugely cheaper. Bidooh has a phenomenal idea, never done before nor presently challenged by other competitors. It is backed by Chairman Michael Edelson, non-exec director of Manchester United football club, who is an extremely successful venture capitalist with much experience in creating new companies. Bidooh is using the power of the blockchain to make digital billboard advertising fast, cheap and totally transparent. Innovative and ground-breaking technology is being used to provide real-time accurate information such as how many viewers see each billboard and even whether they are male/female or wear glasses/a beard etc. Other technologies are in the pipeline such as vehicle and clothing brand recognition. Superb business ideas such as Amazon, Microsoft, Apple etc. were successful because they did certain things hugely better than the competitors in their particular fields. It is certainly not beyond the realms of possibility to see Bidooh do a very similar thing in the arena of out of doors digital billboard advertising. It can’t be argued that what they are going to do is innovative in practically every facet of billboard advertising. Bidooh has huge possibilities and they are very soon to become realities! Previous: Previous post: Disrupting a DOOH advertising market of $34.8bn!